If you need superior stereo sound for small club gigs, churches or speeches, but have to keep the outboard gear to a minimum, the 10-channel PMP2000 can really deliver. This 800-Watt mixer has built-in mic preamps and an FX processor, as well as enough power to drive both mains and monitors, thanks to dual 350-Watt onboard power amps. The PMP2000 gives you the choice of 2 x 350-Watt stereo, 2 x 350-Watt dual mono or 800-Watt bridged mono output. Whether the center of attention happens to be a folk trio, a speech, or a synth-rock band with mind-boggling stereo patches, the PMP2000 can accommodate. This sonic versatility also makes it an excellent choice for churches, where vocals and stereo recordings often share face time. Leave the mic preamps at home, because the quality of sound that was once only available in the studio is ready to go wherever you do. Nine built-in, boutique-caliber mic preamps with switchable +48 V phantom power make it possible to use either dynamic or condenser mics with the PMP2000. It's also equipped with a 24-bit FX processor, giving you 100 mind-blowing digital effect presets such as delay, chorus and reverb. Apply them to any channel, as well as to the monitors and main output. In case you're pulling double duty as sound engineer and performer, the FX processor has a footswitch jack for remote on/off. The PMP2000 gives you loads of flexibility in accommodating whatever the center of attention happens to be. Channels 1-6 are for mics, bass guitars or other mono instruments. Stereo channels 7-12 are ideal for keyboards. Use the 2TR IN RCA inputs to feed in external stereo signals from CD players or tape decks. REC OUT RCA outputs send line-level signals from the mixer to a recording device, so you can finally get to work on that triple-live album you’ve always dreamed of. The left and right Output 1/4" connectors are there just in case you need to connect more amps. Connect your monitor power amps or active monitor speakers to the MONITOR output. Small, simple events call for a lightweight, easy-to-use powered mixer. BEHRINGER powered mixers are the most efficient, affordable mixers for the job. With so many incredible built-in features, it's easier than ever to lend exceptional sound quality to all kinds of public performances. Ideal for stage, studio and an infinite variety of installation applications, Samson’s SM10 Line Mixer is a versatile and reliable addition to your audio setup. This internally powered, 19-inch rackmount metal chassis unit can be easily integrated into any existing system to more efficiently group your signals. The SM10 features ten channels with 1/4-inch stereo line inputs and a balance control for each channel. Two channels include XLR mic inputs. This allows you to blend the relative levels of stereo inputs to your liking. In addition, each channel includes a switch for +4 dBu or -10 dBV line level input. For output, the SM10 provides electronically balanced main stereo XLR and 1/4-inch line outputs. The SM10 provides versatile signal routing via Main Mix, Mix B, Monitor and EFX bus outputs, as well as low noise and discrete microphone pre-amplifiers with 48-volt phantom power. Two auxiliary sends can also be used to route signals to external effects, or create a separate mix for on-stage monitors. The SM10 features front panel headphone and monitor outputs with dedicated level controls. The mix may be audited with the SM10’s 6-segment LED meter and a flexible meter/headphone source control. As a company of musicians, Samson always tries to be in touch with the needs of artists. The revamped Resound HD line is a perfect example of our design meeting the demands of musicians. We've re-imagined our incredibly popular Resound line of passive PA speakers with increased power handling and great versatility from a variety of different enclosure options. Beefier woofers and upgraded compression drivers give the new Resound HD series all the style and performance you would expect from professional-grade PA speakers. The RS12 HD was engineered to provide clear, balanced audio with plenty of power. To achieve this goal, we redesigned the preceding Resound woofer as a custom 12-inch low frequency driver with enhanced power handling. Consequently, the RS12 HD commands 500 watts peak/250 watts RMS power handling at eight ohms. The high frequency management has also been improved with a titanium compression driver, providing a precise, lucid top end. We've also revamped the existing Resound cabinet with durable, lightweight, all-wood construction that aids in effective sound dispersion and provides an impressive aesthetic complement to any professional sound system. Since the cabinets are resilient and lightweight, they are perfect for both portable applications and as fixed installation speakers. Impressive power handling, upgraded compression drivers and tough, lightweight cabinet construction make the RS12 HD a completely versatile enclosure, perfect for gigging bands, houses of worship, performance venues and everything in between. With ample power and pristine audio quality, the RS215 HD is the big boy of the Resound HD line. With dual custom designed 15-inch woofers, the RS215 HD boasts 1200 watts peak/600 watts RMS power handling at four ohms. Employment of a 1.5-inch titanium compression driver also provides enhanced performance on the top end, making for a superior PA enclosure with professional sound. We've also revamped the original Resound cabinet design to be more durable and lightweight, thanks to solid, all-wood construction. As a result, the RS215 HD is a remarkably portable enclosure, despite its size and power handling capabilities. 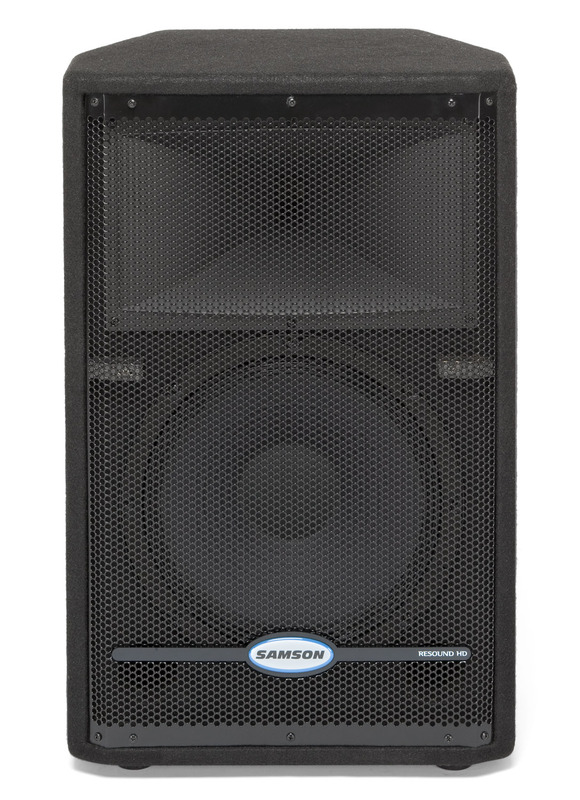 This enclosure's design also acts as an impressive aesthetic complement to any professional sound system and its portability makes it a great addition to the equipment roster of any gigging band. 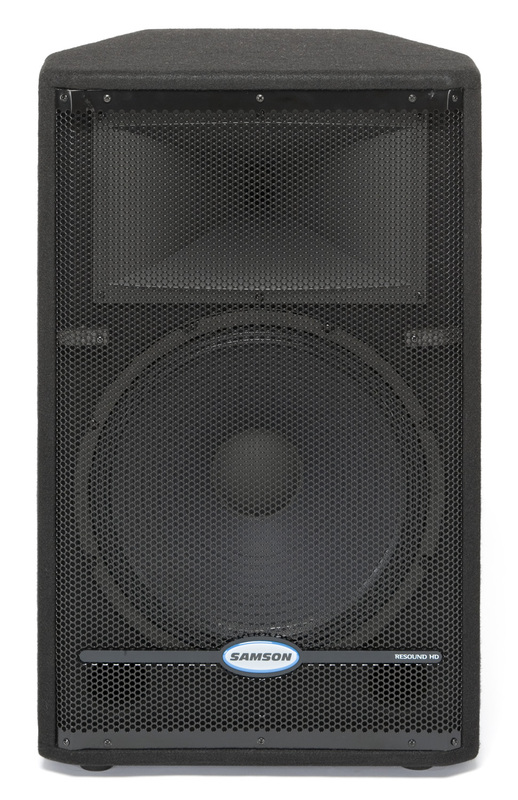 Perfect for on-the-go musicians, houses of worship and performance venues of varying sizes, the RS215 HD offers great power and professional sound in a strong, versatile enclosure. A custom designed woofer with increased power handling is just one of the features that sets the Resound HD PA speakers apart. 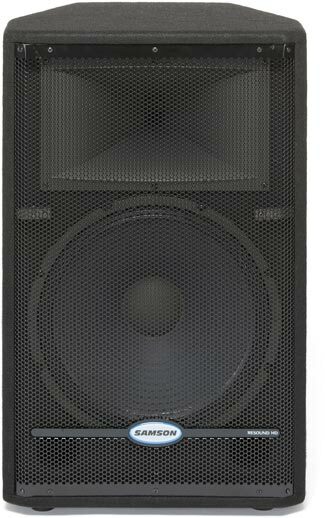 The RS15 HD employs a 15-inch low frequency driver, offering 600 watts peak/300 watts RMS power handling at eight ohms. For a comparably articulate response on the top end, we used a titanium compression driver to handle the high frequencies. This combination of components produces a powerful, full-range sound that will ensure impressive audio in any performance venue. The original Resound cabinet design has also been reworked with durable, all-wood construction to assist in sound dispersion and ensure that these enclosures withstand the test of time and heavy gigging. The aesthetics of the cabinet also make it an appropriate complement to any professional sound system, rounding out the complete versatility of these PA speakers. 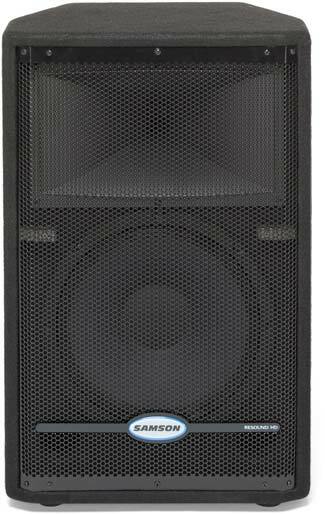 Perfect for gigging musicians, houses of worship and performance venues of varying sizes, the RS15 HD passive PA enclosure offers professional sound in a versatile cabinet that is ideal for both portable and installation applications. The S com plus is a highly adaptable stereo compressor/limiter in an efficient single rackspace design. It is intended for situations where extra flexibility is required to optimize signal levels. It delivers essential control along with simplicity of operation. S com plus's comprehensive and wide-ranging controls provide extensive manipulation of audio dynamics, even in the most complex situations.Each channel features a wide range of variable control. A feature-rich Compressor section includes variable Threshold, Ratio, Attack and Release controls. Samson's SKD (Smart Knee Detector) circuit dynamically adjusts the compression curve to ensure a musical result. Our exclusive AEG (Auto Envelope Generator) function simplifies optimum settings by constantly analyzing the audio input and automatically adjusting the attack and release parameters based on the changing level. Key Inputs and Outputs are included for externally processing the control voltage.